Zombie Apocalypse…. survival guide or excuse for defection behavior? Tonight I get to ask Max Brooks about the implications of seeing the world through a zombie apocalypse. Tune in! A standard of IR theorizing is the notion of the Prisoner’s Dilemma. A zero-sum game in which you can either rat out your partner to avoid heavy costs in exchange for lighter costs, or you can both cooperate and stay silent for a payout to both parties. The potential costs of this thinking are often hidden when thinking about a zombie apocalypse. Apocalypse preparedness is about ensuring that you are ready when global infrastructures fail. 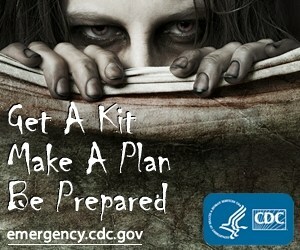 The Centers for Disease Control actually have a site dedicated to zombie disaster preparedness. However, zombie preparedness it is also strongly linked to survivalist behavior which can then be linked back to the PD and defecting rather than cooperating. BUT….If you would like, tune in tonight at 7:30 on Al Jazeera America’s The Stream….as I ask World War Z author Max Brooks himself what he thinks the limitations might be?